Biology has become a powerful and revolutionary technology in today’s world, uniquely poised to transform and propel innovation in the near future. 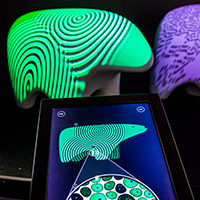 BioDesign Studio engages the public in interactive exhibits that spark imagination and confidence with the burgeoning fields of synthetic biology, bioengineering, biological design and DIY biology. To demystify these cutting-edge fields and technologies, visitors are empowered to explore, tinker and design with the building blocks of life. The gallery delivers more than just knowledge; it allows people of all ages to personally create with biology. We hope to inspire and equip the creative problem‐solvers of the future with a biological tool kit and mindset. 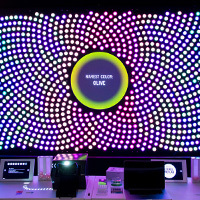 Explore unique and powerful fundamentals of biological systems with vivid displays. Put yourself in the shoes of a single cell or re-code the "fur" patterns of our adorable animals. You are the scientist in this 21st-century version of our well-loved jellyfish DNA wet lab. Use real lab gear to engineer multi-colored bacteria. Discover and add your own living colors to the wall! Explore real-life innovations in biology — such as efforts to engineer mosquitoes to stop the spread of disease. Share your own vision of a future use for synthetic biology. Let your imagination run wild! Use our kit of tangible biological parts to build and program your own virtual creature! Then release it into an immersive world and watch it interact with other creations made by visitors like you. In this evolving workspace, you can try innovative biodesign activities, participate in community projects and explore new biotechnology. 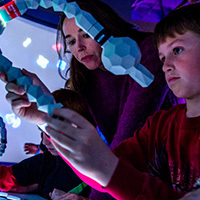 Use real lab tools, create objects with living things, see bioengineered organisms and more. These offerings are free with admission and first come, first served. Dates and times vary; check the schedule when you arrive. Making with Microbes: Explore and experiment with a unique biomaterial grown by visitors right here in our lab! A community of tiny living organisms do the hard work of manufacturing the biomaterial, but they need your help to design and create its final look and feel. View a lecture and slides from 2017 Regan Lecturer Mildred Cho of the Stanford Center for Biomedical Ethics: "Synthetic Biology in the Age of Biohacking"